Deale Rental Center Propane Refilling station locations provide safety and convenience when you want to refill your empty cylinder. The trained staff at every location dispensing propane can help you with purging and filling your propane cylinder. That's right, you keep your tank! We do not exchange your empty for another tank that is full. We REFILL your tank! An Overfill Prevention Device (OPD) is required on all vertical cylinders between 4 lbs. and 40 lbs.. An OPD is currently required in most states. An OPD is a specially designed float device that prevents accidental overfilling, which can cause undesirable gas venting. 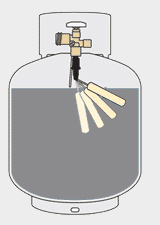 An OPD valve also stops the flow of gas when a cylinder is not connected. Cylinders must bear a manufacture date within 12 years of the date present, or bear a new date followed by the letter "E." This date means that the cylinder is qualified for an additional five years. Cylinders must be equipped with collar and foot ring that are in good condition.